Animal rights activist, Robert Ševcik, walks out of court a free man yet again. For the third waste of time, to be precise. Sergeant Eamon Lynch of Pearse St Garda station, with the aid of the DPP, brought a prosecution against Mr Ševcik, stemming from a protest and a work of obvious fiction that was composed in November of 2008. On Wednesday, Feb 3rd, Robert Ševcik and myself, his McKenzie Friend, walked into Court 17, in Dublin’s new and modern facility at Parkgate st beside the Phoenix Park. This was the third time that Robert has had to go through the pillory of justice’s medieval system, each journey culminating in a hearing where he has resolutely assured that his good name would not be marred with the stigma of criminalisation. The truth has its worth. But in a courtroom, it is uncertain. Even when you can prove a truth beyond any doubt, you might still lose, you might be a criminal. Rob is an animal rights campaigner and a vegan. I’m neither. Yet we have become good friends. I say that to disabuse anyone of the notion that he is some sort of indoctrinated and indoctrinating robot. If he sees some wrong, he’ll not be quiet about it, it’s as simple as that. He’s open to discussion and will not manufacture offence just because someone disagrees with him. He’s very passionate about fur. So is Barnado’s Furriers, at the bottom of Grafton st, near the Molly Malone statue. I suppose the difference between the two to be in the passion. That difference is well exhibited by this case, the result of these passions. The passion of the gardaí, for what they’re doing, might give pause for reflection too. Under cross-examination, Marie Corbett, who was 66 at the time of the alleged incident, at the end of 2008, immediately refused Rob’s generous offer to have her to withdraw the allegation. The allegation being that he had approached her and had screamed “animal abuser!” right into her face. Ms Corbett was happy to chat and present her imaginings as facts to the court, she seemed oblivious to the fact that her testimony had just been placed on the edge of a precipice, and if Rob could produce (and produce it he did) the evidence that he’d challenged her with, it would be flung downwards and shattered. Rob had put it to her that his video evidence and indeed, video evidence gathered by a garda inspector, showed that there was no incident. On top of that, during the cross-examination, she contradicted most of her statement and testimony. Next on the stand was Sgt Lynch. Sgt Lynch claimed that Ms Corbett had walked up to him, told him of her allegation and had identified Rob to him. He then swore that he walked over to Rob and began the interaction that would lead to his arresting the young man. Rob’s video evidence tells a different story. 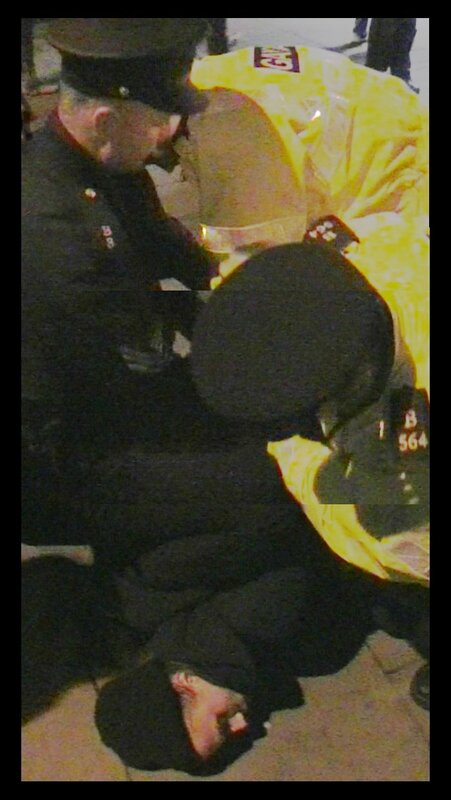 When Ms Corbett was allegedly making a complaint to the sergeant, Rob was a few yards behind them, filming them. The Sergeant walked over to Robert by walking directly away from him, and Ms Corbett waited until she was sure that the sergeant was approaching the correct gentleman (in both her evidence and statement she claimed to have watched the sergeant approach Rob) by leaving the immediate area, without once casting so much as a glance in Rob’s direction. Of course the sergeant waited until she’d left, the only person who could confirm that he’d selected the right man, before walking over to and away from Rob. On the stand, the sergeant claimed that the one and only description he had of Rob was that he had long hair, a ponytail. He told the Judge that there were very few protesters present that night with ponytails, maybe only two. The sergeant was unable to explain how he was able to identify Rob from Ms Corbett’s description. In other words how could he be sure that it wasn’t a second guy with a ponytail that he was looking for? One would think that that would have been the end of it. Not so, the allegation, a section 6 of the Public Order Act allegation, wasn’t even a charge before the court. Rob was up for failing to provide his name and address to the sergeant, under the Public Order Act, and failing to produce identification, like a passport, when required to do so, under the Immigration Act. Two sets of charges for the single offence of keeping the sergeant ignorant as to Robert’s identity and thus frustrating his otherwise non-existent investigation into the complaint that he hadn’t even bothered to record in his notebook. The allegation provided the necessary reasonable suspicion, that enabled the sergeant to demand details. In other words, the DPP and the Gardaí hung Ms Corbett out to dry. This wasn’t about protecting an elderly lady or affording her justice, it was about sending a message to Robert and the other activists. The message being: the Gardaí are very willing to abuse the justice system in order to stop public shows of dissent. Sure, if you have a one-off protest, there’s no problem, you’ll be forgotten about by tomorrow. If you make a regular thing of it though, well that’s unacceptable, and it will be stopped. 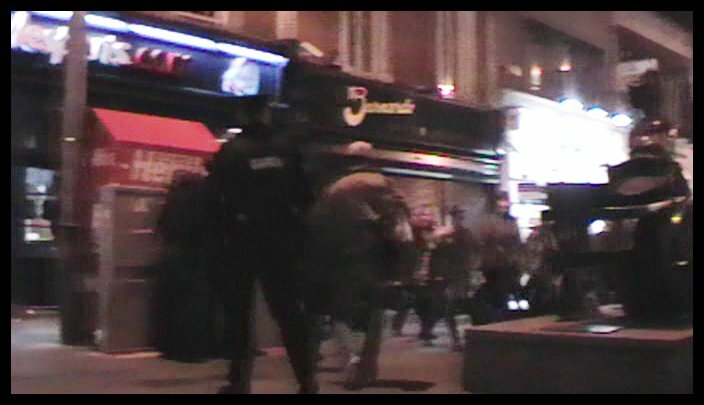 Anyway, the sergeant also claimed that Rob had fallen to the ground when he was arrested and that he and some other other gardaí had tried to put the activist into a sitting position, but he had refused to allow this, so they rolled him onto his side to await his transportation to Pearce st garda station. The video evidence tells a different story. Rob was dragged to the ground by the sergeant. The sergeant and two lackeys couldn’t put Rob into a sitting position as your spine does not facilitate such a degree of freedom when the gardaí have you pinned face-down, with their knees planted into that very same spine. When they noticed that Mr Edmund Long was filming their alleged attempts to put Mr Ševcik into a sitting position, they called for the prone figure to stop resisting. Inspector McMenamin, as expected, provided much useful information. A stenographer was hired and brought into the court with this man’s testimony and answers to Rob’s questions, in mind. The stenographer, who wired the judge, the DPP, Rob and the witness box for sound, was money well spent. I’ll not go into too much of what the inspector had to say at this point as such information has other uses. But I will say this: his video evidence was not continuous, despite his claims and the claims of the DPP. He was not the person who transferred the footage from the 8mm tape, to the DVD that was presented to Rob, as part of his precis and later, played in court as evidence in this trial. That person wasn’t in court. The inspector could not explain how footage that was not recorded by his camera, ended up, added into the footage shown in court. He’d sworn earlier that this was the unedited video evidence that he’d filmed on the night in question. His testimony was akin to watching someone with multiple-personality disorder arguing with himself. He did agree though, even with himself, Rob had not appeared in the part of the footage he’d shot of Ms Corbett and her colleagues closing the shop. In Rob’s precis of evidence, he had received no notice of Inspector McMenamin as a witness, neither did he receive a summary of the inspector’s evidence. The inspector’s evidence made things a lot more complex or convoluted than the simplicity contained in the sergeant’s precis. This was very unfair to Rob. Rob was by law, entitled to a proper summary of the evidence and he was entitled, again by law, to a full and unedited copy of the inspector’s video evidence. But once again, for the innocents out there, this was never about fairness and it was never a search for the truth. It was about using an obviously false allegation, to harass, intimidate, assault, prosecute and criminalise a man for exercising his right to dissent. 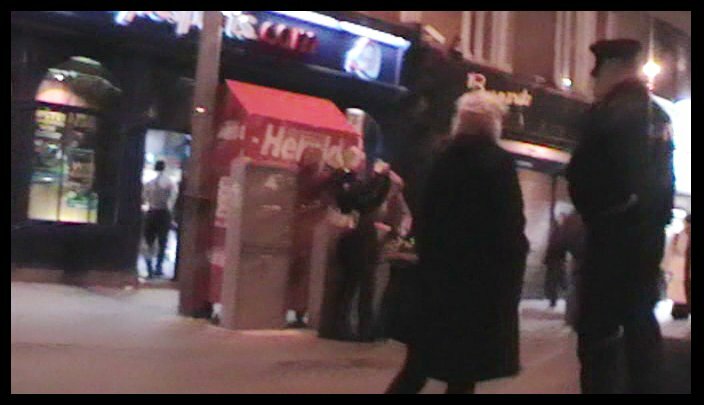 It is Rob’s belief and mine, the audio and video evidence points to it too, that Inspector Patrick McMenamin of Pearse st garda station, told Sergeant Lynch to demand Rob’s details, after Rob had blatantly filmed him in plain clothes, filming the activists. I might add that the inspector’s testimony supports this too. Sergeant Lynch can be heard on Rob’s audio to demand what right Rob had to film and then demanding his details. The sergeant ignored Rob’s request that he identify himself and that he inform Rob as to why he was stopping him (there is nothing unlawful about filming in public as the inspector confirmed under cross-examination). Though in fairness, Rob had recorded the sergeant’s shoulder number earlier, when he was filming. The sergeant went on to tell Robert that he was making his demands under Section 24 of the Public Order Act and that he would arrest him, if he didn’t provide his name and address. Now here’s where things get a bit iffy. Up until this point, the sergeant had said nothing whatsoever about Ms Corbett’s allegation or the Immigration Act. The audio is of poor quality and it’s hard to tell what happens next (any audio experts out there?). Rob says that the sergeant proceeded to arrest him without ever mentioning the allegation (indeed the custody record makes no mention of it either – this being strange, the gardaí would have us believe that the allegation was being actively investigated at the time) and without making any demands under the Immigration Act. The sergeant swore blind that he went into both. 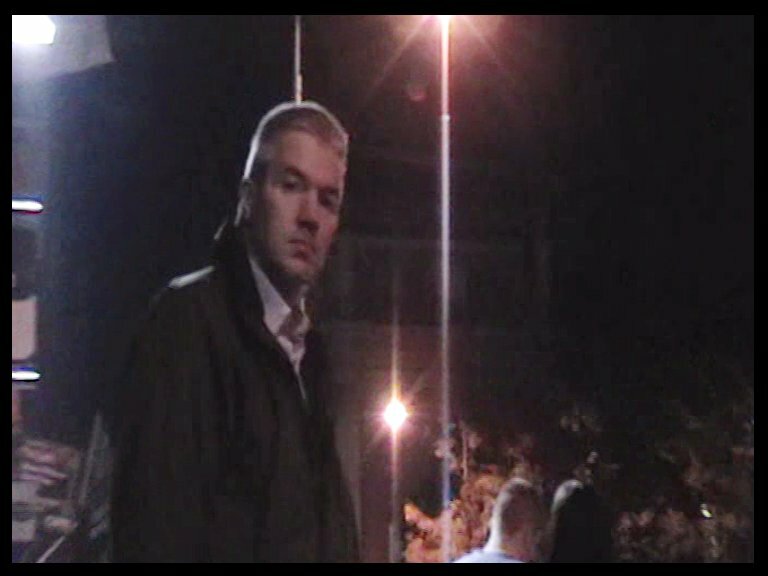 Another garda, who didn’t appear in court, can be seen on Ed’s video, telling Ed that he had heard what had been said. He tells Ed that Rob has been arrested under the Public Order act. He makes no mention of the allegation or the Immigration Act. The Judge, a gentleman, believed the sergeant and found the facts to be proven. He asked Rob if there were any mitigating facts before he decided what to do next. Robert answered that he had never intended to break a law on that evening and that he was still of the firm belief that he hadn’t. Hearing this, the Judge binned the two charges under the Probation Act and ensured that Robert’s record remains unblemished. Before we left the courtroom, there was one more stomach churning moment. I watched the discredited Ms Corbett make her way over to the sergeant and the DPP, arms outstretched and a look of religious ecstasy on her face, as she gushed her thanks and congratulated both. I didn’t wait to see how the sergeant and the DPP responded, life’s too short. Let it be enough that it is most likely that neither has initiated a proceeding with regard to false and malicious complaints.